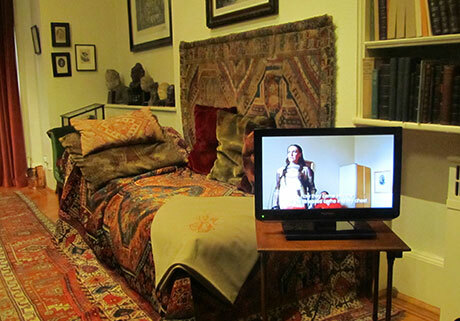 Saying It exhibition tour, Freud Museum London 2012 from Cinema Suitcase on Vimeo. In the house where Freud made his home with his daughter Anna, after fleeing from Nazi persecution, we were invited to exhibit the analysis of the so-called ‘schizophrenic’ Sissi cut up in short fragments, representing single sessions each. Freud doubted that such patients, categorized generally as psychotic, could be helped with psychoanalysis. The reason for his doubt was that psychotics were incapable of reaching into their past and hence, of the transference necessary to achieve ‘working through’. Both honouring Freud’s thought and taking issue with this judgment because of its devastating indictment that sentences psychotics to life-long paralysis by drugs and/or hospitalization, we visualize the work of Françoise Davoine to politely contradict Freud in his own home.